Researchers have demonstrated a new process for the expanded use of lightweight aluminum in cars and trucks at the speed, scale, quality and consistency required by the auto industry. The process reduces production time and costs while yielding strong and lightweight parts, for example delivering a car door that is 62 percent lighter and 25 percent cheaper than that produced with today's manufacturing methods. In partnership with General Motors, Alcoa and TWB Company LLC, researchers from the Department of Energy's Pacific Northwest National Laboratory have transformed a joining technique called friction stir welding, or FSW. The technique now can be used to join aluminum sheets of varying thicknesses, which is key to producing auto parts that are light yet retain strength where it's most needed. The PNNL-developed process also is ten times faster than current FSW techniques, representing production speeds that, for the first time, meet high-volume assembly requirements. The advancement is reported in the May issue of JOM, the member journal of the Minerals, Metals & Materials Society. "We looked at the barriers preventing the use of more lightweight alloys in cars, picked what we felt was a top challenge, and then formulated a team that represented the entire supply chain to tackle it," said Yuri Hovanski, the program manager at PNNL and lead author. "The result is a proven process that overcomes the speed, scale and quality limitations of FSW that previously were showstoppers for the auto industry." The two-phase, six-year project is funded by the Department of Energy's Office of Energy Efficiency and Renewable Energy with in-kind partner contributions from each of the participating companies. 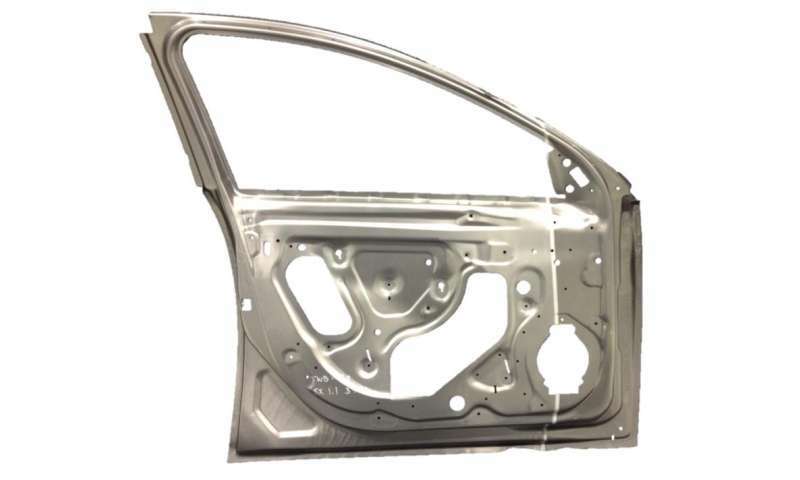 To create door frames, hoods and other auto parts, sheets of metal are welded together end-to-end into a "tailor-welded blank" which is then cut into appropriate sizes before being stamped into the final shape. This process allows a high degree of customization. For example, a thicker gauge of metal can be used on one side of a car part, where extra strength is needed, joined via a weld to a thinner gauge on the side where it's not. Conventional laser welding works great to join varying thicknesses of steel, but can be problematic when applied to aluminum due to the reactivity of molten aluminum to air. Instead, manufacturers today must create several components from single sheets that are then riveted together after being stamped, resulting in additional production steps and more parts that drive up cost and weight. PNNL researcher Yuri Hovanski describes a new aluminum joining process and the industry partnership that enabled its use for mass auto production. "Reducing the weight of a vehicle by 10% can decrease fuel consumption by 6%-8%, so the auto industry is very interested in a welding technique such as FSW that is aluminum friendly," Hovanski said. A friction-stir welding machine looks and acts like a cross between a drill press and a sewing machine. Lowered onto two metal sheets sitting side-by-side, the "drill bit," or in this case pin tool, spins against both edges. As it travels along, the pin creates friction that heats, mixes and joins the alloys without melting them. By auto industry production standards, however, the process was too slow - just one-half meter welded per minute - which is why the technique has been used only in niche applications, if at all. Hovanski and colleagues at PNNL initially compared several joining techniques before selecting FSW, which was the only one to pass all of GM's rigorous weld quality specifications. Researchers then conducted a comprehensive series of lab-scale welding tests on aluminum sheets provided by Alcoa. In all, dozens of unique tool designs with varying shapes, lengths and diameters of the pin were created. These were assessed against a variety of weld parameters, such as the depth, rotation speed and angle of the tool. Through statistical analysis, the team identified the optimal combination of tool specification and weld parameters that could consistently withstand high-speed production demands. "What we discovered was a win-win," Hovanski said. "The faster the weld, the better the quality and strength of the join, thus the significant increase in speed." PNNL provided the weld and tool specifications to TWB Company and GM. TWB Company then independently welded, formed and analyzed more than 100 aluminum blanks in close coordination with GM, making them the first qualified supplier of aluminum tailor-welded blanks. GM subsequently stamped their first full-sized inner door panel supplied by TWB Company—free of imperfections—from aluminum sheets in varying thicknesses. Today, TWB Company has a dedicated FSW machine at their production facility in Monroe, MI, built around PNNL's process that is capable of producing up to 250,000 parts per year. "TWB can now provide aluminum tailor welds not only to GM, but the entire automotive industry," said Blair Carlson, a group manager at GM who con-conceptualized the project. With over two years of funding left, the team continues to collaborate, with a focus on even faster weld speeds and the ability to maneuver around the contours and corners of complex aluminum parts, for which laser welding is not commercially feasible. The team also is modifying FSW to join different alloys, such as automotive-grade aluminum alloys with light, ultra-high strength alloys currently reserved for aerospace applications. "Going forward, we see this process, and future versions of it, enabling completely novel combinations of materials that will revolutionize material use in the auto industry," Hovanski said. More information: "High-speed friction-stir welding to enable aluminum tailor-welded blanks," JOM, April 2, 2015, DOI: 10.1007/s11837-015-1384-x. Stir friction welding for aluminum is not new. It has been used in aircraft designs for years. What's new is that auto manufacturing processes have discovered it. The former Panoz sports car manufacturer north of Atlanta used FSW for its serial-production cars.